Ennis Phoenix Twinning Board will host a Night at the Dogs in aid of the Youth Ambassador Progamme, and other youth projects, at Limerick Greyhound Stadium on Saturday 5 October. The Race Night consists of 12 fast paced races that take place every 15 minutes. The stadium opens at 6.30 pm and the first race is at 7.45 pm. Tickets which cost €10 entitles bearer to admission to the Stadium and to a Race Card. Alternatively you may nominate a dog in a race for just €20 – all winning nominees will have their name included in a draw at the end of the night for a valuable prize. Be a RACE SPONSOR As the Sponsor you will select the name of your sponsored race, receive public acclaim before and after the race, plus complimentary TV Screen and Race Card advertising and 2 passes to the Stadium. The Sponsor may also be invited to make the presentation to the winner of their race. Talk to any member of the Twinning Board for more details and pricing. 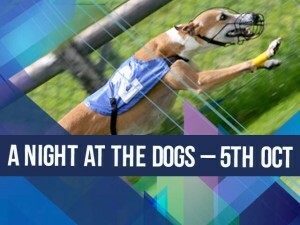 Celebrate a birthday, anniversary or any family occasion (under 16′s admitted free) with a fun and entertaining Ennis Phoenix Night at the Dogs. Mums and Dads can sit back and relax and enjoy a restaurant meal (booking essential) with drinks and betting service to the table while the thrill of the race keeps the whole family entertained! Limerick Greyhound Stadium is the ultimate destination for a night out. With a restaurant, private suites, fast food outlet, carvery and bar the stadium has become one of the best entertainment venues in the Mid-West so you may enjoy fantastic food, snacks and drinks whilst taking in the atmosphere of a Night at the Dogs. So whether it’s a birthday party, hen night, stag night, staff night or family occasion look no further than a Night at the Dogs with the Ennis Phoenix Twinning Board on Saturday 5th October.